Premier Luxury Suites has furnished apartments in downtown Chicago that exceed your expectations. Our furnished apartments come with a unique style based on property and location. Downtown locations will receive weekly maid service. This includes maid service for our condos, short term rentals, long term rentals and executive suites. All of our downtown apartment properties are located close to awesome Chicagoland attractions, such as great places to dine, theatres, museums and historical attractions. It does not matter whether you are traveling for business, luxury or vacation purposes, Premier Luxury Suites has Chicago housing accommodations to meet your needs. Our furnished apartments in downtown Chicago are stunning and charming to say the least. You can view photos on this website that contain custom furniture packages for specific locations. Feel free to speak to one of our friendly Premier Luxury Suites experts regarding any type of particular furniture you would like to have within your urban apartment setting. Our company has both city properties and suburban properties. You can view urban locations, such as One East Delaware, Aqua, The Shoreham, Arkadia Towers and other fantastic city-based properties. Some suburb choices include One Arlington, Woodview, Northshore 770 and Northgate Crossing. Different styles and themes are associated with various property selections. Be sure to also ask about any special offers here at Premier Luxury Suites. Some furnished apartments in downtown Chicago may come with a unique discount. You simply never know when you may be able to get an even better deal than what you are receiving when it comes to extended stay luxury. We have mapped out locations on this user-friendly website to provide you with a better idea of where our properties are situated throughout the City of Chicago and greater Chicagoland region. Premier Luxury Suites also has corporate executive condominiums Illinois, cheap Chicago suburbs extended stay suites and Chicago vacationing residents accommodations for the entire family. Please contact us with any questions that you have regarding our furnished apartments in downtown Chicago. We look forward to having the chance to do business with you. Our apartments come with plenty of great amenities. All rooms are fully furnished and move-in ready! You get high-speed internet service, cable television, a DVD player and iPod Docking Station along with a fully-equipped kitchen. Premier Luxury Suites makes every effort to satisfy your needs when you are visiting or relocating to the Chicagoland area. Chicago is a spectacular city filled with tons of history and amazing things to do. We enjoy having the ability to provide you with furnished apartments in downtown Chicago and other luxury accommodations. Now is the time to contact us to learn more about our furnished apartments and condos. We work with business travelers, individual recreational travelers and people that desire to move into the Chicagoland region. 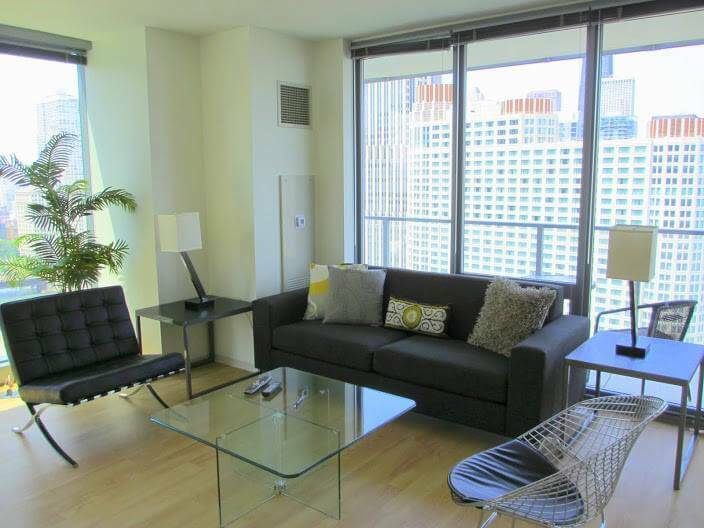 Our furnished apartments in downtown Chicago provide you with scenic views of this gorgeous city. Please contact Premier Luxury Suites to get more information about our long and short term luxury places to stay.